Direct Access is division of CIMB Bank Berhad and the Pioneer and Champion in offering FREE for Life Credit Card. It offer No Annual Fees with no other term and condition like No minimum spending or transaction. Direct Access MasterCard and Visa Credit Card are specially reserved for graduates and professionals only. Up to today they have more than 250,000 card holders. I have been with Direct Access for more than 5 years and very happy with their service. It also have banking facilities. Imaging doing your banking need via Phone after office office. Direct Access rewards you 5% rebate at any petrol station on the 1st of every month with Direct Access WORLD, Platinum or Gold MasterCard and 2% rebate on all other days from 1 July 2009 to 31 December 2009. You claim this cash rebate at any Petrol station like Shell Station, Petronas Mesra, Esso Station, BHP etc. 5% rebate at Tesco and Giant on the 1st of every month with Direct Access Visa Infinite, Visa Platinum and Visa Gold and 2% rebate on all other days from now till December 2009. ** Both of the reward campaigns are limited to maximum rebate of RM50 per month. ** Rebate shall be capped at a maximum spending of RM200 or rebate of RM10 on every 1st day of the month and subject to a maximum spending of RM2,500 or rebate of RM50 per monthly statement. So go grab one Direct Access Credit Card if you do not own one today. Great rebates await Direct Access MasterCard and Visa card members at petrol stations and hypermarkets. So fill your trolley and your car tank with Direct Access. KUALA LUMPUR, July 8 (Bernama) — CIMB Bank Bhd hopes to launch three credit cards through its division, Direct Access, by end of this year, head of direct banking & cards, Jean Yap Yoke Yuen said. It will be a collaboration between two professional bodies and a university alumni, she told reporters after the launch of Direct Access Chartered Tax Institute of Malaysia (CTIM) Affinity Card here Wednesday. “We are targeting niche markets like graduates and professionals and would like to have more collaborations with them,” she said. For the Direct Access-CTIM Affinity Card, Yap said the bank hoped that all CTIM members, currently about 2,500, to take advantage of the card’s benefits. Among the benefits are a clean overdraft facility of RM10,000 for members with minimum income of RM60,000 per annum, no annual fees and special rebates and discounts at over 500 merchant outlets in Malaysia. The bank currently has 300,000 credit card holders under Direct Access. CIMB Bank Bhd aims to grow its Direct Access credit card base by 15 per cent per year, as it ties up with professional associations. “Direct Access targets graduates and professionals. Therefore, we will be working with professional associations to sign up members,” said head of direct banking and cards, Yap Yoke Yuen. Yap was speaking to reporters after CIMB Bank launched the Direct Access Malaysian Bar MasterCard for members of the Malaysian Bar Council on Friday in Kuala Lumpur. With a current base of 250,000 Direct Access cardholders, CIMB Bank has tied-up with other professional associations such as the Association of Chartered Certified Accountants and Malaysian Medical Association to increase its customer base. The bar council has 12,500 members, of which 2,000 members have been signed up for the card. The Direct Access Malaysian Bar Mastercard is a free-for-life credit card, without annual fees. “We are able to provide members of the Malaysian Bar with innovative solutions for their various financial needs, from obtaining loans and making payments,” said CIMB Bank chairman Tan Sri Haidar Mohamed Nor at the launch ceremony. Benefits for card members include a two per cent rebate at all petrol stations nationwide, a bonus point for every ringgit spent, discounts at over 500 merchant outlets and flexi pay plan on purchases above RM1,000 at any retail outlet. Haidar, former chief judge of Malaya, added that the bank will channel a percentage of spending on the cards back to the bar council to fund its activities. This entry was posted on Monday, August 31st, 2009 at 10:57 am	and is filed under Credit Card. You can follow any responses to this entry through the RSS 2.0 feed. Both comments and pings are currently closed. I am using direct access since 5 years ago and my card has been expiry on last month. Before that I rang to Direct Access for a few times regarding my new card but I very dispointed with the service because until today i have no yet receive any card from them. 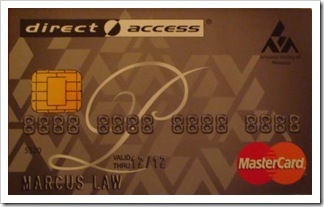 Direct Access automatically send me the new cards before the expiry date.